I'm Proud to Announce...Kellee Moye! It's hard for me to contain the excitement that has been building all week in anticipation of this announcement! I'm thrilled to welcome Kellee Moye as a contributor to Teach Mentor Texts. Kellee and I became friends on Twitter where we have shared countless books that we both love and have exchanged e-mails over the ups and downs of teaching. 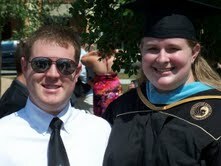 When my family was in Orlando in June, I was able to find a little time to finally meet Kellee face to face. We were so excited and chatty that we didn't get a picture of the two of us together, but we did have someone ask us if we were longtime friends who hadn't seen each other in a while and were catching up. We were both amazed because we had only just met in person maybe 20 minutes before. I have loved being a book blogger. It still amazes me to look back at the authors, publishers, teachers, and other bloggers I have connected with because of starting Teach Mentor Texts. Having Kellee be part of this blog is exciting for me because it means Teach Mentor Texts is going to be bringing you more book reviews and another perspective when it comes to using books as mentor texts and teaching with mentor texts. I am so grateful for all of my readers out there and I hope you welcome and enjoy Kellee as much as I do. "I have always been a reader. When I was younger, my mom made the mistake of telling me that she would always buy me any book I asked for- it is a wonder she isn’t broke, because I sure took advantage of that promise! My favorite childhood authors were Dr. Seuss, Carolyn Haywood, Roald Dahl, Beverly Cleary and Ann M. Martin. I also loved to read Peanuts, Garfield, and Archie comics. Now I read over 100 books a year (I’m aiming for 175 this year, but am already ahead!). I mostly read juvenile, middle grade or young adult though I throw in some professional books and a few adult books throughout the year. I have a book with me at all times including in the car where I listen to audio books. Now, my favorite YA book is The Giver and my favorite adult book is The Sun Also Rises. 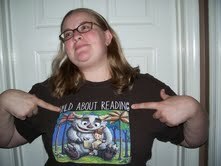 I never ceased loving reading and even went on to get my Bachelors in Literature. After my undergraduate degree, I had to decide how to share my love of reading and decided that teaching was the perfect occupation (and my mom & sister said “I told you so!” since they’d always said I’d be a teacher). I went on to get my Masters in Elementary Education with an ESOL endorsement and a reading certificate. I have been fortunate enough to teach middle school for the last 5 years. I taught 6th grade ELA (English Language Arts) for 3 years, 7th grade ELA for 2 years and am starting my first year as a 7th grade reading teacher. I have built up my classroom library to over 1600 middle grade and young adult titles (thank goodness I have an understanding husband! Love you Jim!). My goal as a teacher is to help each student find the lifelong love of reading that I have been lucky enough to have. As a teacher now, though, I’ve had to refocus how I read each book- not just for fun, but also as a possible addition to my classroom. I was lucky enough to have Jen offer to let me contribute to her blog regularly so I can share with others the great books and resources I find!" TMT-Jen: Like you, I read everywhere, too. If there's any downtime I'm ready to break out my book! Can you describe your favorite or ideal reading spot? 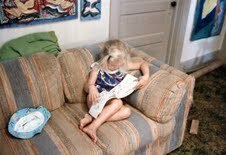 Kellee: My favorite spot to read is still sitting on my couch in the corner like the picture of me when I was 2. It is really the most comfortable place to read and I've been doing it all my life. My ideal reading spot would probably be sitting by a lake with a cool breeze coming off of it (well, as long as there were no fire ants and I had a blanket so I could spread out if I wanted to). But really, I will read anywhere. TMT-Jen: I love that your mom said she would buy you any book you wanted! That's great! As a teacher, what advice do you give parents to encourage them to read with their children at home and to support them in their reading development? Kellee: One of my pet peeves as a teacher is when parents try too hard to dictate what their child is reading. Telling your child to read books they don't like is not going to make them like reading. Also, I find it frustrating that more parents do not read what their children read (or at least research what they are reading) so that they can have meaningful conversations with their child. By building a reading community in your own house, it really encourages children to read. And, being able to tell your child you will buy them any book they want really does help too! TMT-Jen: I happen to know you live right next door to Mickey Mouse and I just so happen to love Disney World which means I have to ask you a Disney World question! What is your favorite ride/attraction at Disney World at any of the parks and why? Kellee: I love Disney too! It was so weird moving here when I was 14 and all of a sudden living by everyone's favorite place that I'd dreamed about going to all my life. As for my favorite attraction, I would have to say the safaris and nature walks at Animal Kingdom are my favorite- I am a big sucker for animals. My favorite ride is the Tower of Terror. It freaks me out every time! Kellee: Fundamental. Reading allows access to life long learning (and entertainment)! Thanks, Kellee! I hope everyone gives a warm welcome to Kellee. You can look for her reviews starting next week. Kellee is also on Twitter and GoodReads if you want to find her there.